Interactive Science is a next generation K-8 science program featuring an innovative Write-In Student Edition (Grades 1-8) that makes learning personal, relevant, and engaging. 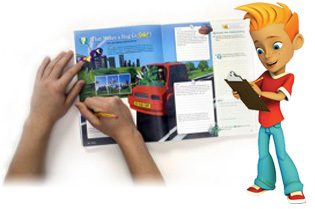 Your child will get all of the content, interactivity, and practice they need between the covers of a single book. Each chapter begins with an engaging question and activity that set up the lessons and focuses your child on the Big Question to consider throughout the chapter. Each lesson within the chapters is embedded with a number of engaging activities and questions that will challenge your child to think deeper about the material. Every chapter ends with an Investigate It! project that ties the lessons together. Additionally, there are vocabulary cards, games, a study guide, and chapter review questions at the end of the chapter. Grades 6-8 courses focus on Earth, Life or Physical Science per grade year.